Firms and brokers that offer leases meeting sustainability criteria will be recognized in an effort to get tenants and landlords collaborating to save energy. The new program will incentivize green leases. Applications are now open for Green Lease Leaders, a program that establishes a standard for green lease programs and honors firms and brokers that successfully implement it. Developed by the Institute for Market Transformation (IMT) and the U.S. Department of Energy’s (DOE) Better Buildings Alliance, the Green Lease Leaders program is designed to help tenants and landlords work together to save energy by encouraging them to set sustainability conditions in the lease. 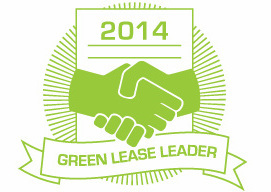 To be recognized as a Green Lease Leader, a landlord’s or broker’s lease agreement must include a tenant cost-recovery clause, which rewards the tenant for making energy-efficient capital improvements, and incorporate a minimum of three other provisions. Examples include requiring tenant disclosure of monthly utility data or setting sustainable operation and maintenance rules. Another set of requirements applies to a tenant lease. Applications will be open until April 8, 2014, and the first group of recognized firms and brokers will be announced at DOE’s Better Buildings Summit in Washington, D.C.